Having 4 percent of all the chips in play might not seem like much, but when there's still 116 players in the field, it's a big deal. Chris @RUKidingMe44 Hinchcliffe was the dominant stack, then he flopped the nuts on the final hand before dinner break, with the 2nd nuts shoving in to him, and now Hinchcliffe sits at 370,000 - more than 100k clear of the field in the #OneDay100k. 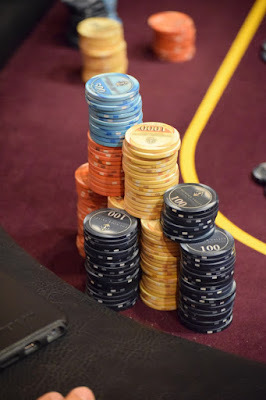 Here's chipcounts from around the room as cards get back in the air.